EXTRA DISCOUNTS: Purchase this item by itself or with any other items from Dayton's category to receive an extra discount based on the total value of category products in your Shopping Cart. Click the link for more information. Dayton MaxLife die springs are manufactured in the USA from pre-tempered chrome silicon wire produced from valve-spring quality rod which is specially prepared for producing die springs. Pre-tempered chrome silicon provides improved dimensional accuracy and minimizes stress points. The dimensional sizes, pressure and travel ratings, and color code are designed to be compatible with the very popular Raymond die springs. The high quality raw material and a unique mechanical design prepares the Dayton springs to significantly outperform other major brands. 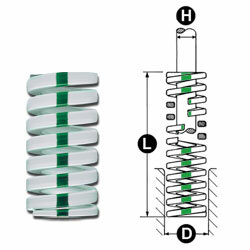 SHIPS FROM: Dayton MaxLife die springs are sent directly to you from a warehouse in Michigan.